Tonight, for the first time since I arrived in Spain, I felt like I was in Europe. And it was all thanks to tapas. Earlier this week, our first week in Spain, some friends and I were keen to try some tapas, that all-important Spanish ritual of eating and drinking that seems so simple yet, somehow, the Spaniards have perfected to a near art. 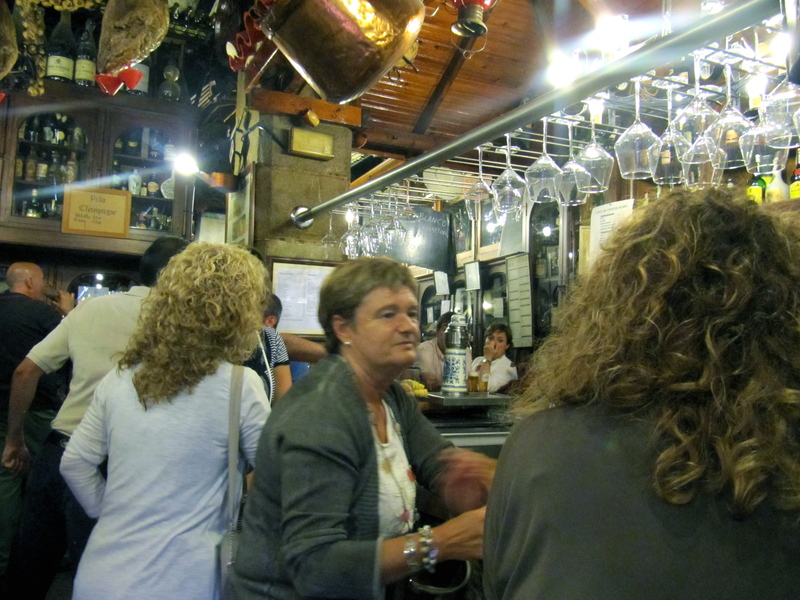 Oh, you can imagine the anticipation as we crowded into the center of a tapas bar that was just opening for the evening. That was short-lived. It only took us a hot second to realize that we had no idea what we were doing, and then scuttle back onto the street. How does one do tapas? We looked at each other quizzically, and decided to work the question over with some helado (ice-cream), which, incidentally, is never a bad idea in Santander, but that’s another matter. For those of you who are new to the Spanish culinary scene, let me bring you up to speed. Tapas are small plates of food, typically consisting of jamón (cured ham), queso (cheese), huevo (egg), patate (potato), or maybe some variation of pescado (fish) commonly piled on a slice of pan (bread). That is the traditional variety, but some more “cutting-edge” establishments are serving up favorites from Latin America, including pint-sized burritos à la Mexico and Argentinean empanadas. Something similar, often confused with, but slightly different from tapas is pinchos, or pintxos (in Basque). Pintxos are a bit smaller, or more delicate, and much more work intensive, with a lot of care going into details and presentation. The best are said to be found in San Sebastian. Tapas are usually eaten either just before lunch (1 pm – 3 pm) or just before dinner (6 pm – 9 pm). The idea is for the light meal to hold you over until the appropriate dining hour arrives. This is especially nice for foreigners who are not used to the Spaniard’s late mealtime hours. The food is also meant to accompany your pre-dinner drink. A Spaniard would never drink on an empty stomach – they know how to hold their alcohol. 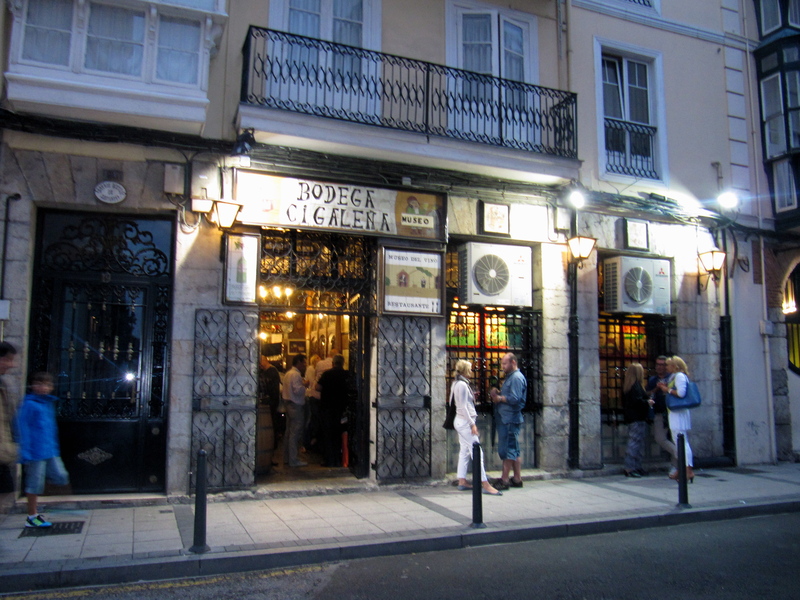 While tapas can be found at most restaurants, bars, and cafes in Spain, some establishments specialize in tapas. Tapas can be found all over Spain, although they prefer the above-mentioned pintxos in Basque country. I hear that in Granada it is written into law that every round of drinks ordered must be accompanied by a free plate of tapas. I, for one, am intrigued. Friends and family go out for tapas in groups of three or four. This is because tapas are typically eaten standing at a counter or gathered around a small cocktail table – there’s simply no room for more! Now let’s get back to the million-dollar question: How does one do tapas? Tapas is something akin to a moving cocktail hour (or two). You travel with your group from restaurant to bar to etc. The norm is to visit three places in an evening. 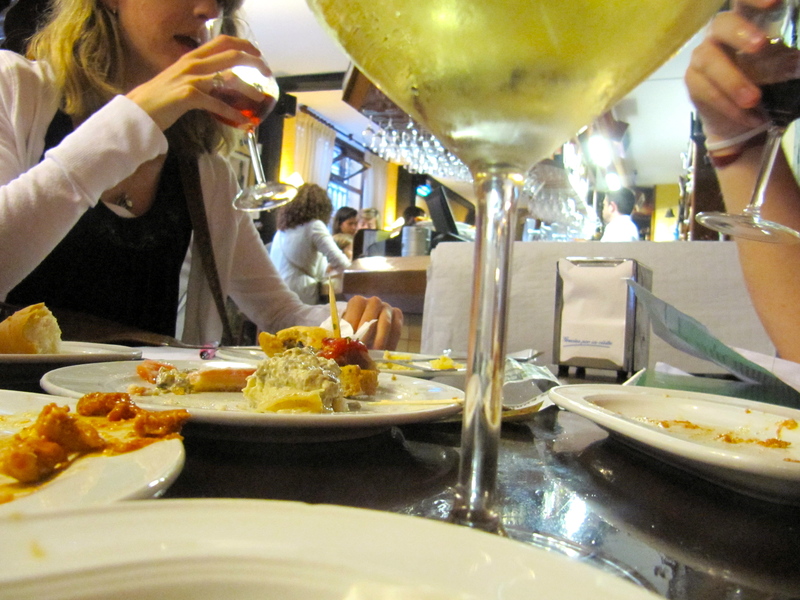 At each locale, every member of your group samples one or two tapas and a drink (the Spanish drink of choice is wine). While everyone orders one tapas a piece, it is understood that each tapas will be shared amongst the group. 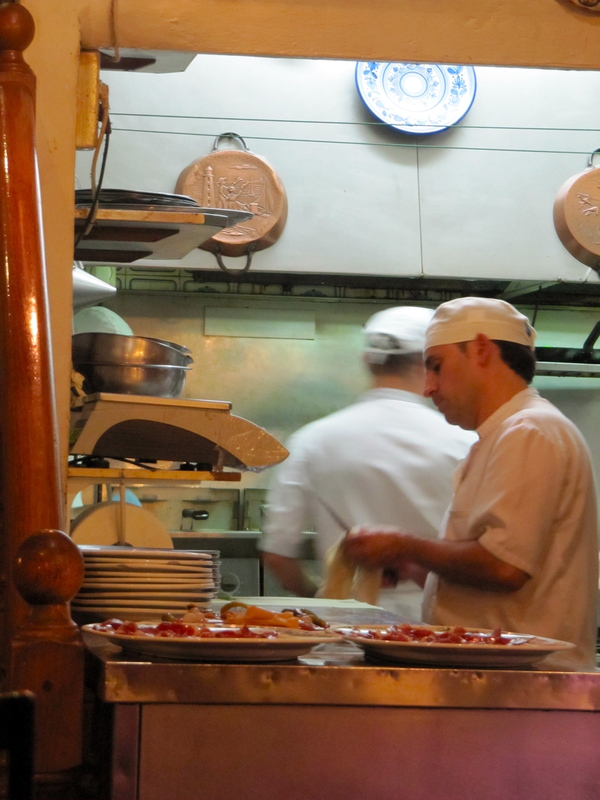 Tapas are customarily ordered at the bar. There will be a crowd of people instead of a line, so be prepared to jump in when you are ready to order. There may or may not be a menu. If there is no menu, then you may choose from the tapas that are on display on the counter. Either way, try to know what you want to order before the server gets to you. Neither the server nor those waiting behind you will appreciate you taking the time to peruse what’s on offer. Oh, and one person orders for everyone in the group. Don’t be nervous if you aren’t sure what to order. I’ve asked several Spaniards what their favorite tapas is and every single one of them has reported, “They’re all good!”. To pay for the bill, everyone throws about 5 Euro into the proverbial pot. This will cover everyone’s drink and tapas. Nobody is allowed to count out who-owes-what. If you do not partake in a round of tapas, you do not need to contribute to the bill at that establishment, that’s fine. But please, above all else, take your time and relax. It is tempting and all too easy to finish off a quick tapas in a few minutes – but don’t. A good way to slow down is to watch how much is left in your glass compared to what is left on your plate: is your glass half full but your tapas nearly non-existent? Then now would be a good time to take a breath and enjoy. Watch the scene around you, or indulge in some conversation – you know what to do. Tapas is simple, and Spaniards understand this. And that, dear reader, is the beauty behind the art of tapas.